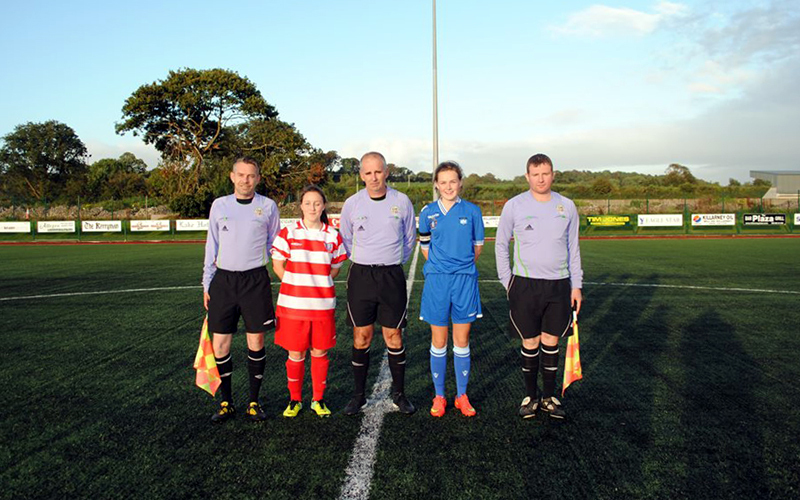 Limerick FC/LWSSL found Cork WSSL too strong in the MWFAI Under-18 Women’s Interleague final in Killarney on Friday night, losing out on a 7-2 scoreline. The decider, played on the all-weather pitch at Killarney Celtic’s ground, was, as the scoreline suggests, dominated by Cork who were in control from the kick-off. The Cork WSSL – led by current Under-19 International Megan Connolly – dominated midfield and had the Limerick defence in all sorts of trouble. They soon hit the front, breaking the deadlock inside six minutes. The Limerick/LWSSL girls fought back and within a couple of minutes equalised through ace striker Rebecca Horgan, who headed home after a free-kick was expertly delivered into the box by Niamh McCormack. Cork continued to press strongly and it took some last-ditch defending and some great saves from ‘keeper Rebecca Noonan to keep Limerick level. The Cork pressure, though, eventually paid off on 36 minutes when they regained the lead after a mix-up in the Limerick defence. Limerick/LWSSL, with Cloda Kirby now operating in midfield, had their best period of the match after this and pressed strongly for a second leveller. Sadly, it was not to be. And on 42 minutes, Cork’s star player Connolly scored their third with an unstoppable 35-yard free-kick that found the top right-hand corner of the net, leaving the half-time score 3-1. The second half saw the Limerick/LWSSL girls start brightly but disaster struck on 49 minutes when they were caught on the break and Cork finished clinically to make it 4-1. This score, coupled with the goal conceded just before the break, really broke the hearts of the Limerick girls and Cork added on a fifth goal on the hour-mark to cement their dominance. To be fair, Limerick/LWSSL never gave up, with Louise Horgan and Erin Jacobsen giving their all. On 71 minutes, they were awarded a penalty when Horgan was upended in the Cork box. Noonan duly scored the spot-kick, giving the ‘keeper no chance. Limerick/LWSSL pressed forward to try to reduce the deficit but without any luck against a resolute Cork defence. As the girls pressed forward, they were vulnerable to the Cork counterattack and it took a brilliant display of goalkeeping from Noonan, who made a string of top-class saves, to deny the Cork attack. As the game wound down, the Cork girls added two goals in injury-time to seal their merited 7-2 victory. 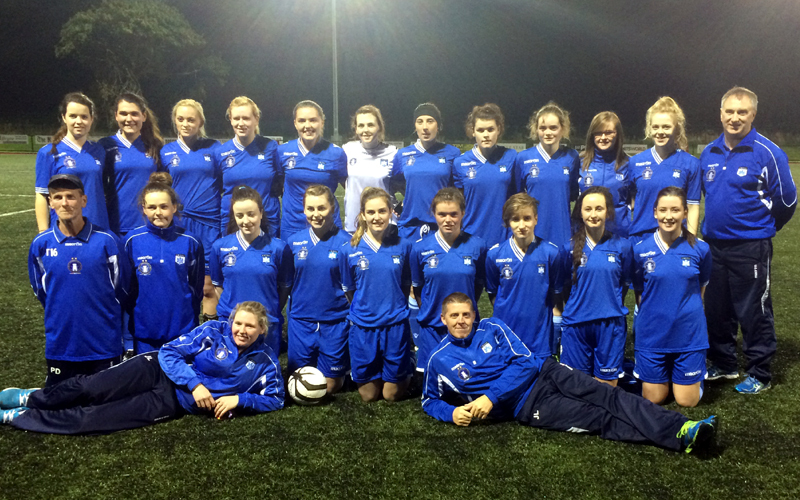 Congratulations to the Cork WSSL on their victory in the inaugural Under-18 Munster FA Interleague competition. On a difficult night for the Limerick girls, there were great performances from Louise Horgan, Erin Jacobsen, Niamh McCormack, Cloda Kirby, captain Laura O’Neill, Rebecca Horgan and an outstanding performance by goalkeeper Rebecca Noonan, who was simply magnificent. ‘The LWSSL would like to thank the following people: Patrick Harnett and the Munster FA for organising the Under-18 tournament, Limerick FC once again for their support and generosity throughout the season. We especially would like to thank Kieran Judge for all his efforts on our behalf throughout the season. Limerick FC/LWSSL: Rebecca Noonan, Megan O’Rourke, Louise Horgan, Megan O’Brien, Erin Jacobsen, Niamh McCormick, Cloda Kirby, Laura O’Neill (C), Clodagh O’Halloran, Shelley Goggin, Rebecca Horgan. Subs: Aileen McDermott, Grainne Kelly, Ceile Corbett, Chloe O’Brien, Zoe McInerney, Janet O’Carroll, Grainne O’Mahoney, Zoe Ryan.